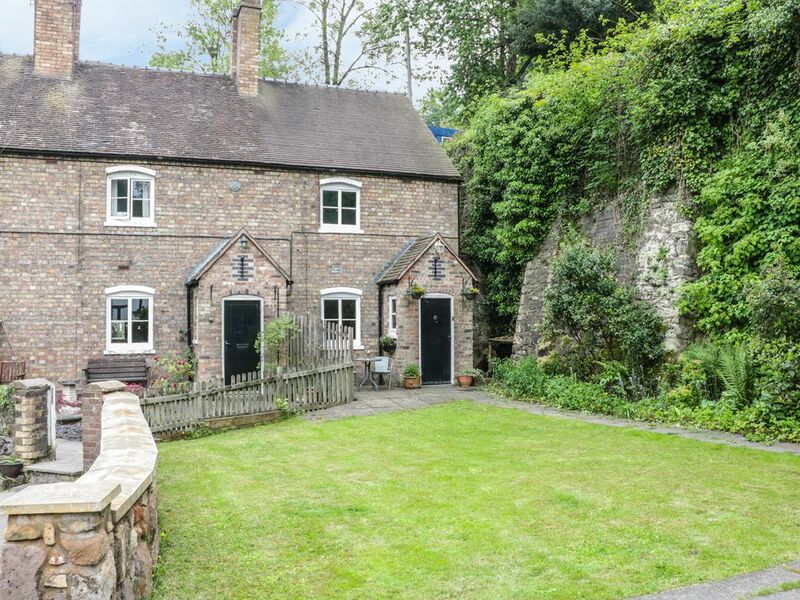 This traditional, stunning cottage is located in the town of Ironbridge in Shropshire and can sleep four people in two bedrooms. Bridge View Cottage boasts both a traditional country cottage feel and an idyllic location, just yards away from the central Shropshire tourist town of Ironbridge. The cottage has two bedrooms, one double with views of the bridge, one twin and is serviced with a bathroom with shower. To the front, a large lawned area with side patio and furniture, or a private patio is to the rear, again with furniture, and a parking permit supplied for one car for parking in nearby public car park. In a wonderful location, a short walk up the path gets you to the bridge from where you can stroll across the river for all the town's many amenities and attractions, making Bridge View Cottage a perfect spot for a charming break in Ironbridge. Amenities: Gas central heating, woodburning stove. Electric oven and gas hob, microwave, fridge, washing machine, slimline dishwasher, TV with Freeview, DVD player, a selection of books, games and DVDs and WiFi. Fuel and power inc. in rent. Bed linen and towels inc. in rent. Loading and unloading outside property. Parking permit for one car for use in nearby public car park 200 yards away. Secure bike storage. Enclosed front lawned garden with patio area and furniture. Enclosed patio area to rear with furniture and charcoal barbecue. Sorry, no pets and no smoking. Shop 8 mins walk, pub 2 mins walk. Town: Known as the birthplace of the industrial revolution, Ironbridge is now a unique wooded valley with plenty of footpaths, bridleways and country lanes. Renowned for being home to the world's first iron bridge (built 1777-1779), this village offers an array of shops, pubs, restaurants and museums. Nearby are the towns of Shrewsbury, Ludlow, Bridgnorth and Much Wenlock. Gas central heating, woodburning stove. Electric oven and gas hob, microwave, fridge, washing machine, slimline dishwasher, TV with Freeview, DVD player, a selection of books, games and DVDs and WiFi. Fuel and power inc. in rent. Bed linen and towels inc. in rent. Loading and unloading outside property. Parking permit for one car for use in nearby public car park 200 yards away. Secure bike storage. Enclosed front lawned garden with patio area and furniture. Enclosed patio area to rear with furniture and charcoal barbecue. Sorry, no pets and no smoking. Shop 8 mins walk, pub 2 mins walk.